Science in the Classroom from AAAS collects a variety of annotated research papers and provides teaching materials to help students better understand the structure and purpose of scientific papers. You can currently find one chemistry article and two biology articles- I’m assuming more resources will be coming soon. Seems like an excellent resource for high school science teachers- these also provide nice resources for the Common Core State Standards focus on research and complex text. On Monday I found myself working with a group of science education leaders from around Washington state. 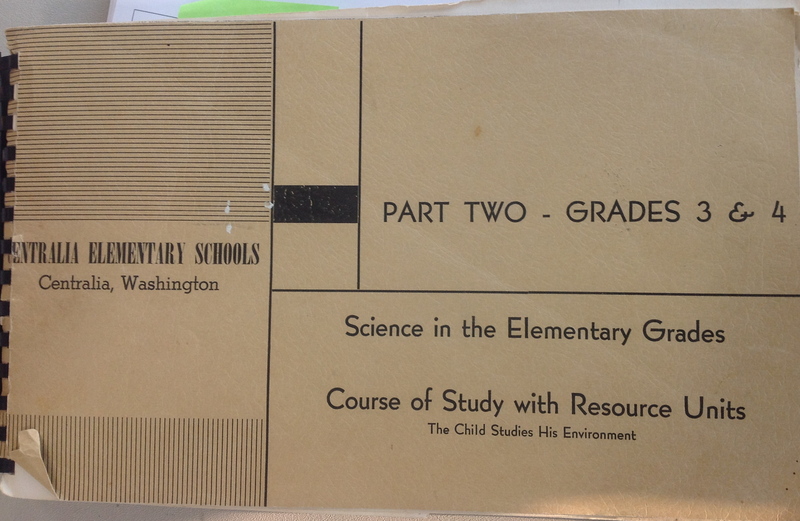 Craig Gabler from ESD 113 brought an old copy of Science in the Elementary Grades from the Centralia School District written in the early 1960s. I opened the document to the first page and found the following text. Science education has three facets. The one is content, the other method, and the third is attitude. All too frequently, teachers of science become too involved in the content of science. In reality, science taught in this fashion becomes just another reading or lecture course. Hence, the methods that lead the learner to develop hypotheses from observation, checking these hypotheses or guesses for validity, and eventually arriving at a conclusion, are important. Finally, the accepting of a proven conclusion, even though it is apparently contrary to fact in the attitudinal area is a necessity. Therefore, content, method, attitude assume different roles in science than in teaching history, reading, etc. Content is arrived at through method to change attitude. Science becomes a way of thinking, a method for solving problems, a retreat from the thoroughly emotional plane of living. This text made me think of how we are still struggling to meet this vision for science instruction 50 years later… We may not use the same terminology but the gist is the same. So as we embark on the next generation of science standards, how will these standards be different? How will they help us to change and grow and improve our instruction? Or will someone just stumble on a dusty tattered copy of the NGSS document in the year 2062 and think, “We are still trying to do that”. Veritasium just posted another video (Misconceptions about Temperature) of interviews that uncover misconceptions about temperature of different objects/materials. 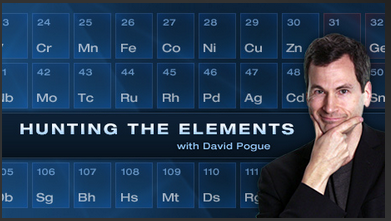 This could be a perfect companion piece to a previous Veritasium clip on temperature (see a previous post HERE). These clips could be used to uncover your middle school or high school students’ ideas about temperature, heat transfer, and properties of materials before, during, or after instruction. Benchfly is a FREE video platform for sharing video tips, protocols, etc on common lab science practices. The Benchfly Blog is beautifully eclectic and while it contains some references to mature topics- it paints a compelling picture of the nature of science. The most recent blog post features The Scientific Talk Report Card. See image below. 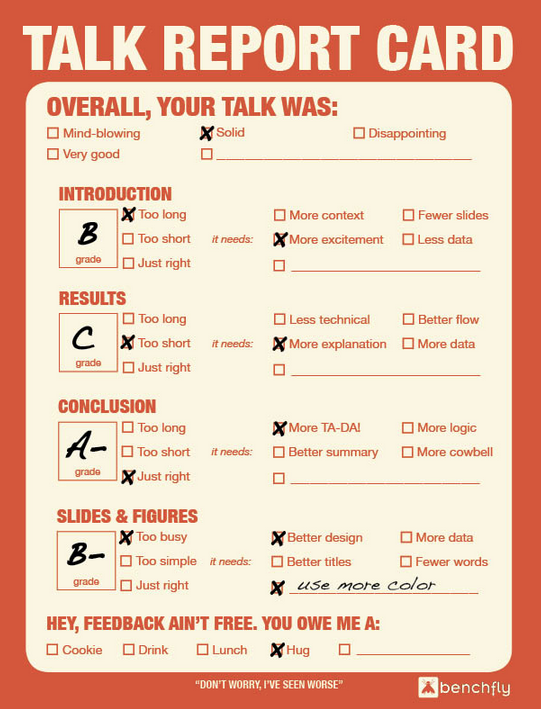 Might be cool to show high school students that even real lab scientists seek feedback on their presentations. For an example of a Video Protocol, see Pouring an Agarose Gel. If you have an iPad, I highly recommend the FREE Hunting the Elements app.. you won’t be disappointed.